Preheat the oven to 350°F. Use non-stick spray to spray a 9×9″ baking pan. Set aside the baking pan as the oven pre-heats. In a food processor, add all ingredients except chocolate chips. Using the food processor, mix all ingredients until everything is uniform. Turn off the food processor, add chocolate chips and using a spoon mix the chocolate chips into the batter. Using a spoon or spatula, scoop the batter into the pan and bake for 25-30 minutes. Remove from oven, allow to cool, and enjoy! 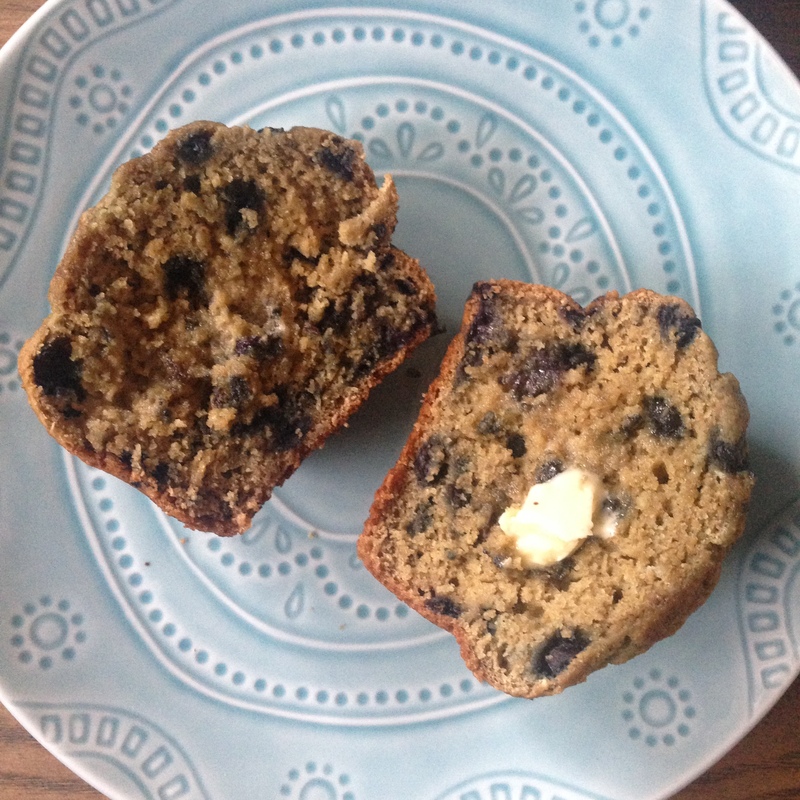 Back to the muffins, the following recipe is full of fiber and antioxidants from the wild blueberries. If you can’t find wild blueberries, regular blueberries (fresh or frozen) will work just fine. 1 cup non-dairy milk (I used hemp milk for this recipe). Add more if needed. Combine the flour, baking powder, baking soda, sugar, and oat bran together in a large bowl and mix well. Add the oil, applesauce, non-dairy milk. Add the wild blueberries (no need to defrost if you’re using frozen ones). Grease a muffin tin or use muffin tin cups. Using a spoon, transfer the muffin batter into each cup evenly. Bake for 25-30 minutes. The muffins will be ready when golden in color and if the “toothpick test” comes out clean (insert a toothpick into the center of a muffin. If done, none will remain on the toothpick after removing if from the center of the muffin). If you’re wondering about the title of this post, let me explain. I created this recipe while being awake at 6 AM which is just a few minutes past sunrise where I am, and thinking about how I really wanted a brownie. 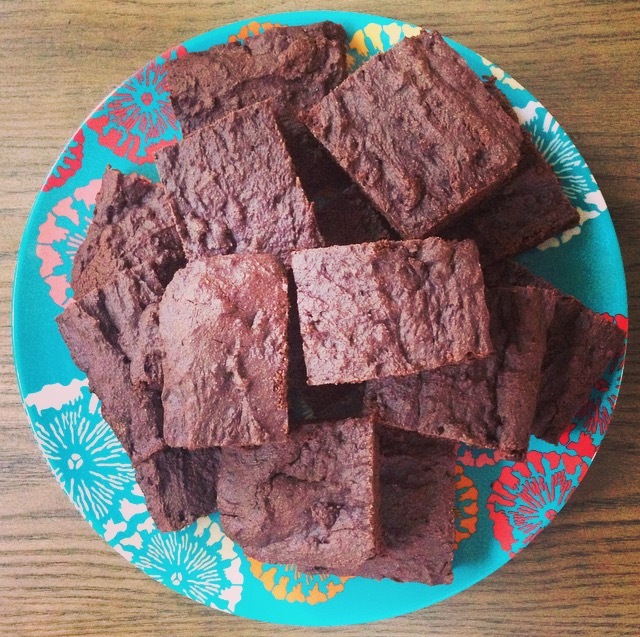 As a nutrition enthusiast, I realize brownies are not an ideal breakfast food, but a girl can dream and dreaming leads to creating. 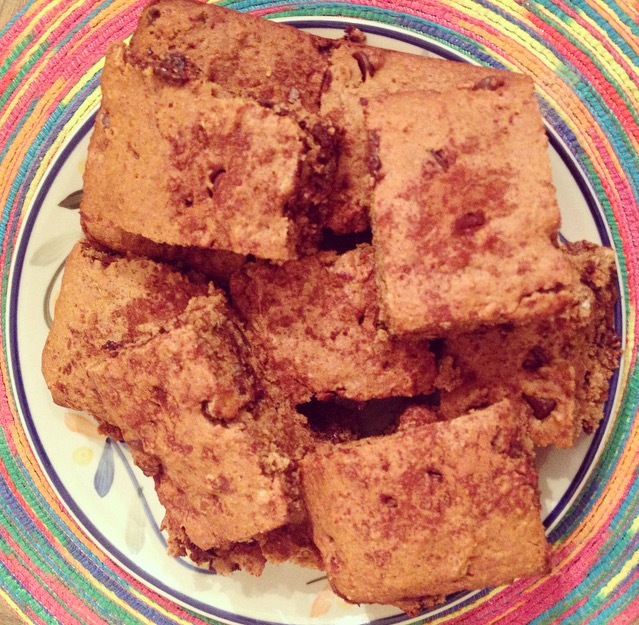 Make no mistake, these definitely aren’t a health food, but using whole grain spelt flour adds a bit of fiber. These brownies aren’t super chocolatey, so feel free to add chocolate chips or something else to add more flavor. Measure dry ingredients (flour, salt, baking soda, and cocoa powder) and mix together in a large bowl. Melt the earth balance spread, measure apple sauce, agave nectar, vanilla extract, and unsweetened soy milk and combine in a bowl. Mix with a whisk or spoon. Grease a brownie pan and using a spoon, transfer the brownie mixture to the pan, spreading with the spoon if necessary. Bake at 350ºF for about 27 minutes (figure 25-30 minutes is ideal, check with a toothpick for readiness). If you haven’t noticed, I’ve been in a baking kick for the last few months. Something about the colder months makes a warm baked good even more tasty (and I don’t think anyone will ever complain about the scent of freshly baked cookies/muffins/bars etc. filling up the house). My latest recipe is a combination of a few of my favorite things: maple syrup, nuts, and chocolate chips! I made these in bar-form, but if you’d prefer a cookie, you can simply use a cookie sheet instead of an 8×8″ baking pan. You can also swap gluten-free flour for the wheat flour if you’re following a gluten-free diet. Remove from oven, allow to cool, cut (if you’re making bars) and enjoy! 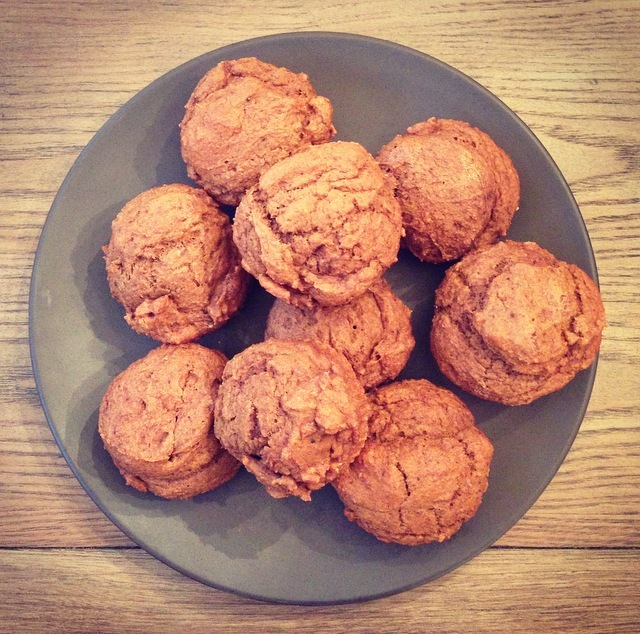 As I mentioned in an earlier post, I’m obsessed with pumpkin flavored things, so this weekend I created a healthy, flavor-packed vegan pumpkin spice muffin! This recipe is not very sweet (because I didn’t use that much sugar) so it can be eaten alongside something sweeter or with a savory stew or soup. 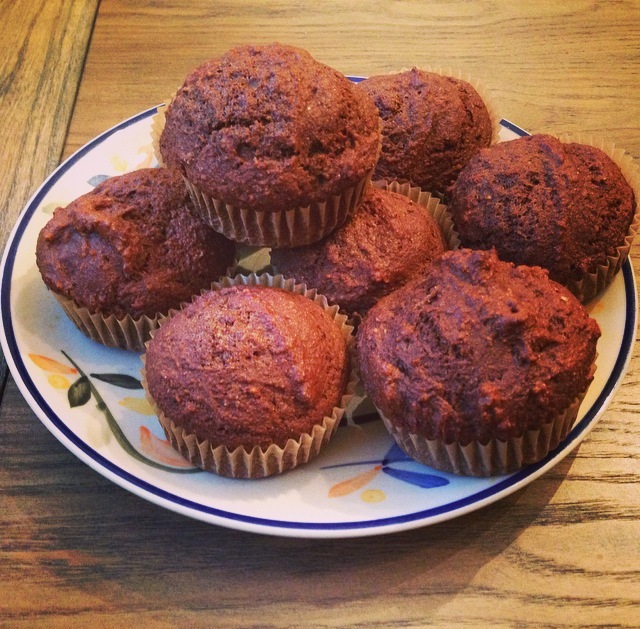 These muffins pack a punch of vitamin A and a good helping of fiber, so enjoy and know that it’s possible to make a truly healthy muffin.